GET YA RESULTS HERE !!!!!!!!!!!!!!!!!!!! a million to everyone who took part. I dont know about the longest day but so dark hear gotta put light on! Dylan 1999 (approx) - 26/12/09. Love you forever. Voting in final closes at 8pm tonight . Best get my votes in soon! Semi final voting ....................... Get ya votes in hunnies. It's so so close the results that one vote can swing which babes get into the final!! Hardhardhard!!! Voting done. Lovely photos, note to self to get organised next year for the catshow. Well the agony if finally over, I have voted. Sorry to all those I could not vote for - blame Rosella . "Tuesday 21 June Summer begins - Longest Day"
Its the longest day and mid summer so all downhill to winter I am afraid..........where has this year gone! -direct by bank transfer over the Internet which would save on Paypal fees. If you are able to pay by this method, please PM me or another staff member for bank details but again please show Cat Show with your Purrs user name on the transfer. -sent by post using a cheque or money order. Please include a note of Purrs member name. That was agonising Sooooo many gorgeous cats yet only 3 votes! 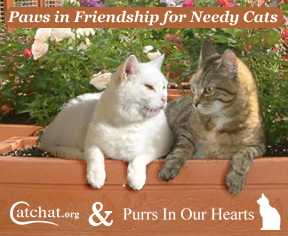 THE 2011 PURRS CAT SHOW IS NOW OPEN FOR VOTING!!!!!!!!!!!!!!!! As there are two pics of them both I'd be happy if one was withdrawn and another finalist was allowed through - or is that too controversial? I'd say the latter Mrs D'ya wanna get me lynched or wot? Congrats to those who got through and well done to the rest of us too. I'm very proud that Luna got into the semi final at her first attempt and watch out next year! Don't know how on earth I'm going to choose just three out of the fab babes here, could take me till 21st to decide!! well done to all that got through and also well done to all who didn't. They are all so stunning and i have to say this is the hardest show we have ever had i think.